Shane Lowry produced another barn-storming performance — especially on the par threes — to take a three-shot lead into the final round of the HSBC Abu Dhabi Championship. Leading by just one stroke from Lois Oosthuizen starting the day, he carded a five-under par 67 to leave his Richard Sterne three adrift and Ian Poulter five behind at Abu Dhabi Golf Club and set up an opportunity to win for the first time in nearly three-and-a-half years. But after showing real resilience yet again after following an early birdie four at the second with a bogey at the par-three fourth to be tied for the lead with Scott Jamieson and Sterne, he’s excited about his chances. “It was good,” Lowry said as the Bee Gees “Stayin’ Alive” blared in the background. “I played good. I felt very comfortable out there today. i am very happy about that and very excited about tomorrow. I am in a great position. Three birdies in a row at the sixth, seventh and eighth put him four clear of Sterne and Spain’s Pablo Larrazabal on 15-under. 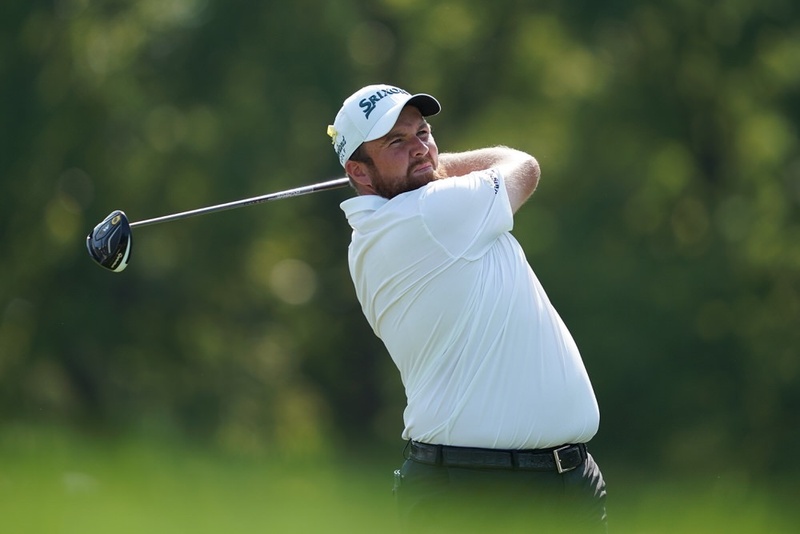 And while the South African would get to within two shots with an eagle at the 10th, Lowry took his tally of birdie twos for the week to an incredible nine from 12 attempts when he made a 10 footer down the hill at the 12th and an 18 footer at the 15th to lead by three from Sterne with three to play. “I’ve never seen anyone in my career play par threes as well as Shane has done,” Paul McGinley said on Sky Sports of the Offaly man’s “off the charts” play on the short holes. That was high praise indeed from McGinley, who was a par-three specialist himself having honed his game at Grange, where there are six par-threes on the original layout. Lowry did not drive the ball as well as he might like and his eighth missed fairway of the day at the 16th led to a bogey that cut his lead to two. After missing a seven footer for par there, he found the fairway at the 17th but after bunkering his approach, he hit a lovely recovery that released up the green and slotted a two-and-a-half footer to remain two ahead. Ian Poulter — still going strong despite only arriving on the eve of the tournament after a 36-hole trip from Hawaii — eagled the 18th to get to 12-under after a 69. But Sterne hit a horrible approach that caught a fairway bunker at the 18th and couldn't make birdie, carding a three-under 69 to post the target at 14-under. Lowry had a chance to extend his lead to three with a birdie at the 18th and he did just that, two putting for a four and a five-under 67 for a three-shot lead over Sterne on 18-under. “There were only a few scoreboards out there and I was on the 12th green when I saw that Richard Sterne was after making a few,” Lowry said. “But I was going about my business and my own game and trying to make as many birdies as I can. After going 1258 days without a win, he’s under pressure after a mixed record as a pace-setter heading into the final round. At the 2009 Irish Open, he was tied with Robert Rock but eventually beat the Englishman in a playoff to become just the third amateur to win on the European Tour. At the Portugal Masters in 2012 he was four adrift of Bernd Weisberger but shot 66 to win by one from Ross Fisher while at Akron in 2015 he was two behind but shot 66 to win by two from Bubba Watson. There have also been disappointments, however, all when leading going into the final round. At the 2016 US Open at Oakmont he led by four shots but finished tied second behind Dustin Johnson after a 76 and also failed to win when leading (tied with Aphibarnrat) the Turkish Airlines Open in 2017 (T15th). McGinley sees a different Lowry this year, however, and believes he has the mindset to finish the job. “If he shoots 69, they have to shoot 65-64 to catch him,” McGinley said. “So the ball is in Shane’s court. He’s got the lead, the way he’s playing and his short game is spectacular. “This week, interestingly, he’s putted well in windy conditions and his chipping is superb. So even if he does miss greens, I expect him to get it up and down. Lowry blooms again in the desert: "I completely thought I was gone, I didn't think I had that in me today"